In 2014, during a guided tour on the foreshore at Greenwich one of the walk attendees picked up an unusual decorated pipe stem. And it turns out that this small artefact has a big story to tell…..
One of our FROG members, mudlarker James Ward was able to identify the pipe stem fragment as part of a ‘Walter Raleigh pipe‘. 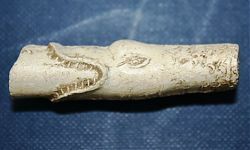 He found a much more complete example in 2008 at Chambers Wharf in Bermondsey, which shows a bearded man on the bowl and a crocodile on the stem of the pipe. So why does this represent Sir Walter Raleigh? Well, legend has it that Raleigh fell overboard one day, and he was seized by a crocodile, but the animal found the smell of smoke so unpleasant that it released him! The decorated pipes found at Greenwich and Bermondsey are examples which represent this story, made in Holland probably during the 1630s – 1640s. Raleigh was a favourite of Queen Elizabeth I, and popularised smoking at the Royal Court. However, Elizabeth’s successor James I hated smoking (he even published a book entitled in 1604 entitled “A Counterblaste to Tobacco”) and he hated Raleigh. He imprisoned him for thirteen years, and eventually Raleigh was executed at the Tower of London in 1618. A pipe pouch with clay pipes and tobacco stopper from the Wallace Collection in London is believed to have been Raleigh’s own. James I imposed harsh restrictions on English pipemakers during his reign and many emigrated to Holland during the early 17th century; the number of English pipemakers in the Netherlands rivalled England by the third decade of the 17th century. Diane Dallal’s article in Smoking and Culture: The Archaeology of Tobacco Pipes in Eastern North America summarises the background to this migration, and examines how 17th century pipemakers imbued their products with symbolism, including the “Tudor Rose”. 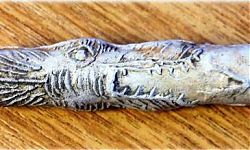 She describes how the Raleigh pipes encapsulate several layers of meaning, and may trace their origins from ‘Jonah’ (or ‘Jonas’) pipes, drawing on the Biblical story, as the crocodile could also be a toothed whale. 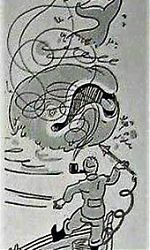 (This association of Raleigh and Jonah continued all the through to the 20th century, as can be seen in this 1936 advertisement for pipe tobacco!). The Raleigh pipes were made as a memorial to the great smoker, with James I represented as the sea monster or snake ‘who swallowed Tudor power’. 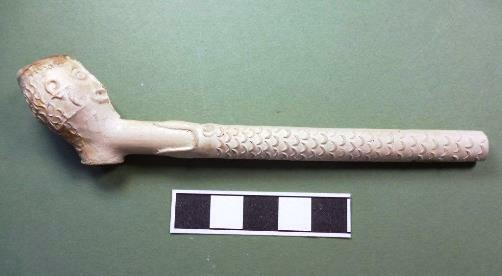 Raleigh pipe fragments have been found on sites all over England including one found in a back garden in Helpringham, Lincolnshire by Joanna Hambly and recently in Petworth Park during excavations by the National Trust. Another example (from London?) is shown here. In Europe, they are commonly found in the port towns of the Netherlands and have also been excavated from a site in Prague. Numerous examples have been recorded in North America, and others have been recorded on the Caribbean island of Saint Maarten, and from the 1656 wreck of the Gilt Dragon off the coast of Western Australia. 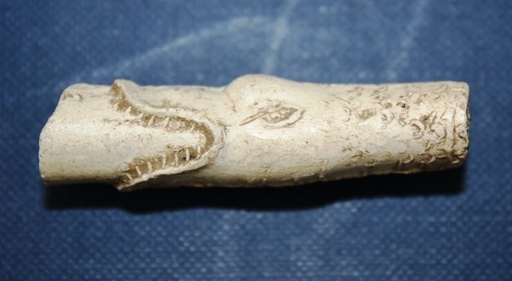 You can find out more about clay pipes commonly found in London here.